Benjamin Franklin once said, “Tis impossible to be sure of anything but death, taxes and Gronk spikes.” Okay, maybe those weren't his exact words, but since 2012, Rob Gronkowski has scored at least one touchdown in an ungodly 66 percent of his games. Your tight end strategy can be summed up in two words: auto-play Gronk. Unfortunately, as much as you may want to roster him at all costs, there will be times when you will have to take a more nuanced approach. How do you go about selecting a tight end in daily fantasy? Editor's Note: 4for4 has an ALL-NEW DFS SUBSCRIPTION! It includes our revolutionary Lineup Generator, Stack Value Reports, Ceiling & Floor Projections, GPP-Specific Articles, Ownership Outlooks, DFS Theory Articles, Lineup Construction Articles, a Downloadable .csv with Projections and Salary Data, and much more! DETAILS HERE! Targets have a stronger correlation1 to tight end fantasy points than any efficiency metric. Prioritize volume over efficiency when selecting a daily fantasy tight end. Table 1 shows how various relevant statistical categories for tight ends correlate to their fantasy points per game using FanDuel and DraftKings scoring systems. The sample includes all qualified2 tight ends from 2013 and 2014. Tight ends typically see shorter targets than wide receivers, which explains why there is almost no relationship between catch rate and fantasy points – tight ends by nature catch a high percentage of their targets, but drawing those targets in the first place is the real challenge. Tight ends were targeted on only 20 percent of all passes in 2014, compared to 60 percent for wide receivers. Because they see the least amount of opportunities to rack up fantasy points over the course of a game, tight ends don’t have as much yardage potential as other positions. In fact, only two tight ends averaged more than 60 receiving yards per game last season, compared to 27 wide receivers. Tight ends’ relative lack of yardage makes them highly touchdown-dependent. The importance of touchdowns for fantasy tight ends is supported by the strong positive correlation of red zone targets to fantasy points. League-wide, the percentage of passing touchdowns that occur in the red zone is 68 percent. For tight ends, that figure climbs to nearly 80 percent. Red zone targets are worth more to tight ends than other positions because tight ends convert red zone targets into touchdowns at a 31 percent clip, much better than the 22 percent rate for wide receivers and the 16 percent rate for running backs. As long as a tight end is getting red zone targets, he has an above-average chance at converting those looks into six points. You may be able to find value during the season in tight ends that have been getting red zone targets, but not converting them – red zone touchdown rate is not very predictive, anyway. The lack of past touchdowns will keep a player’s salary depressed, but the opportunity is still there for him to rack up touchdowns going forward. Besides looking at red zone target market share, a way to find the tight ends who will likely get the most red zone targets is by looking at teams expected to move the ball well – usually the teams with good quarterbacks. A tight end’s red zone targets may also increase if his team starts small wide receivers that aren’t proficient in the red zone. The Chiefs, Seahawks and Titans project to start 2015 with wide receivers on the small side, and more teams may have to do so during the season due to injury. 4for4 tracks each team’s percentage of touchdowns to tight ends, wide receivers, and running backs in its RedZone Tendencies report. If you were successful at daily fantasy football back in 2013, chances are your first question of every week regarding tight ends was, “What team does Arizona play?” The 2013 Cardinals gave up 28 percent more schedule-adjusted fantasy points (available exclusively to 4for4 subscribers) to tight ends than the second-worst team versus tight ends. The Cardinals were an easy target, but overall there is not much differentiation between teams in fantasy points allowed to tight ends due to the low-scoring nature of the position. Targeting an outlying team versus tight ends is easy, but not always viable. Although weak by relative standards, the strongest correlation was total real points allowed, which makes sense since tight ends rely heavily on touchdowns. When in doubt, target players in games that Vegas projects their team to score a good amount points – a good rule of thumb regardless of position. I thought it was possible a defense’s stinginess to wide receivers would have caused opposing offenses to target their tight end more than usual – Cardinals coach Bruce Arians even said in 2013 that he wasn’t concerned with their lackluster tight end defense since the trade-off was playing strong defense on wide receivers. However, this reasoning didn’t hold up – there was only a weak correlation between production teams allowed to wide receivers and the production they allowed to tight ends. Many studies have been done on the viability of tight end streaming in season-long leagues, and those studies translate to daily fantasy as well. In a nutshell, the studies found that in favorable matchups, mediocre tight ends produce at nearly the same level as the league's better tight ends and vice-versa. The problem is that without the benefit of hindsight, it is difficult to accurately pinpoint who the favorable matchups truly are. Remember those league-worst 2013 Cardinals? They were the number one defense versus tight ends the year before. The more the season goes on, the more evident the teams truly susceptible to tight ends become, but there’s still a ton of variance and randomness in the fantasy points allowed to tight end numbers. Since tight ends see the fewest targets, statistics allowed to tight ends have the smallest sample size of all defense-versus-position statistics. If a tight end otherwise fits the framework of a strong selection, you don’t need to avoid him solely on the basis of a tough on-paper matchup. Consistent fantasy performers are ideal for maximizing your floor in cash games, while volatile players help boost your ceiling in tournaments. Each position has a different inherent level of weekly consistency, which can affect what direction you take in terms of who to pay up for when building your lineup. Tight ends, on average, are the least consistent fantasy players. This is because they get the least opportunities to score fantasy points. The league leader in tight end targets per game averaged 8.7, trailing the leader in pass attempts (41.1), running back touches (28.1), and wide receiver targets (11.5). To measure the consistency – or volatility – of a data set, divide its standard of deviation into its mean, giving you its coefficient of variation (CV). In Figure 3 below, I calculated the league-average CV for each fantasy position by taking the average CV of all qualified3 players at each position in 2013 and 2014. The shorter the bar, the more consistent the position is. Despite being projected for the same amount of points, the two pairs have significantly different floors due to differences in positional consistency. Pair 2’s higher floor would be the better choice in a cash game, while Pair 1’s higher ceiling would be the better choice in a tournament. Generally, tight end is a position you’ll want to conserve salary on in cash games – each dollar you spend on a tight end is not raising your floor as much as it would if you spent it elsewhere. Individual CV can also be used to compare the consistency of players within the same position. For example, last season Julius Thomas (11.9) and Greg Olsen (11.2) had similar FanDuel averages, but Olsen’s CV was 58 percent while Thomas’s was 82 percent. Olsen hit 2x value 50 percent of the time, compared to only 31 percent for Thomas – a huge difference that could have a significant impact on whether or not you finish in the money in a cash game. It’s worth mentioning a caveat with using individual CV is that the sample size will inevitably be small – it would be unwise to become overly reliant on this data. I always like to clarify that CV is not meant to take the place of projected point-per-dollar values, nor is it meant to paint you in a corner in regards to how you allocate cap space. Rather, it should be combined with projections to clarify the possible range of outcomes – or, floor and ceiling – associated with each player. Once floor and ceiling has been calculated, you can divide each by the player’s salary to arrive at projected floor and ceiling values. Throughout the NFL season, I will apply CV to 4for4’s award-winning projections to arrive at ceiling and floor values. Should You Pay Up For Gronk? Last season I contemplated whether to pay up for Jimmy Graham in cash games given the high volatility of tight ends. Consistency data ultimately led me to the conclusion that paying up for him wasn't prudent. His floor looked to be lower than comparable options at other positions. It turns out the process led to the right decision. Graham had an inconsistent 2014, posting two cash game lineup-killing goose eggs – in decent matchups4, no less. 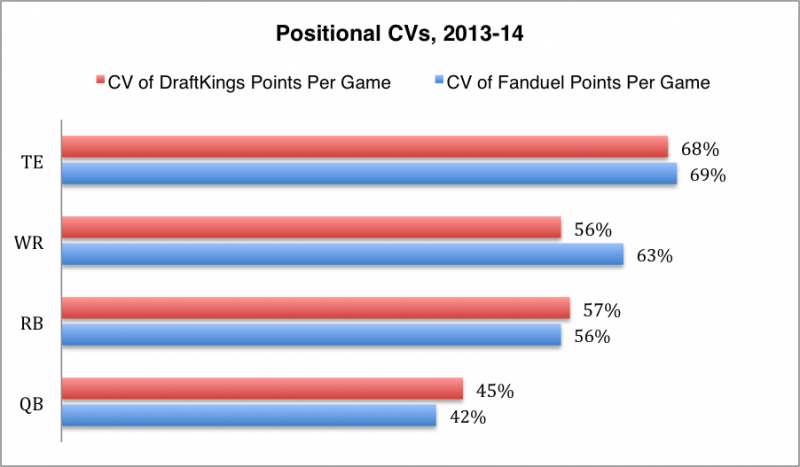 Table 3: How Does Rob Gronkowski’s CV and Points-per-game Average Compare to Similar Fantasy Point Scorers? Gronkowski was significantly more consistent than the average tight end in 2014. In fact, he was more consistent than everyone on the list in Figure 4 except the quarterbacks. The data suggests there is nothing wrong with paying up for Gronkowski – provided you aren’t doing so at the expense of a similarly valued quarterback. Since Gronkowski profiles as a fine cash game play, does that in turn make him a poor tournament play? To find out, let’s measure his ceiling in two ways: his highest fantasy point total and his amount of 30-point games. Table 4: How Does Rob Gronkowski’s Ceiling Compare to Similar Fantasy Point Scorers? You’d like to see Gronkowski eclipse 30 points more than once, but his high score of 44.9 bested all but one player – he still has gargantuan upside. Tom Brady’s looming suspension does increase Gronkowski’s risk, so this information may be best put into action once Brady returns. Targets have a stronger correlation to tight end fantasy points than any efficiency metric – emphasize volume over efficiency. Tight end fantasy production is touchdown-dependent – red zone targets are critical. A tight end shouldn’t be avoided solely because of a tough on-paper defense-versus-position matchup. Tight end is the least consistent fantasy position – this generally means not risking much cap space on them in cash games. Rob Gronkowski exhibits uncommon consistency for a tight end, making him an asset in cash games. 1. A quick refresher on correlation: The scale is -1 to 1. Positive values indicate variables move in the same direction, while negative values indicate variables move in opposite directions. An absolute value of 1 means perfect correlation. Absolute values above 0.7 are considered strong, those between 0.3 and 0.7 are moderate, and those under 0.3 are weak. 2. To qualify, a tight end’s season needed at least six games played and six-plus FanDuel points per game. 3. To qualify, a player’s season needed 6 games played, with a 10.0 fantasy point-per-game average for QBs, 8.0 for RBs/WRs, and 6.0 for TEs. 4. Pittsburgh gave up the 13th-most fantasy points to tight ends and Detroit gave up the 15th-most (FanDuel scoring).